On Tuesday as part of CES 2017, Faraday Future unveiled the FF 91, a production electric supercar that is competitive with Bentley, Ferrari and Tesla Motors platforms for performance, speed, style, comfort, connected telematic features and even autonomous driving capabilities. COURTESY Faraday Future unveiled its first production FF91 model, an electric supercar that the company plans to manufacture at a factory being built in Apex Industrial Park within the city of North Las Vegas. One of the long, tented pavilions at the World Market Center in downtown Las Vegas was converted into an indoor drag strip with bleacher seating during the FF 91 unveiling event to highlight the speed and performance of the production supercar against other top performing models. 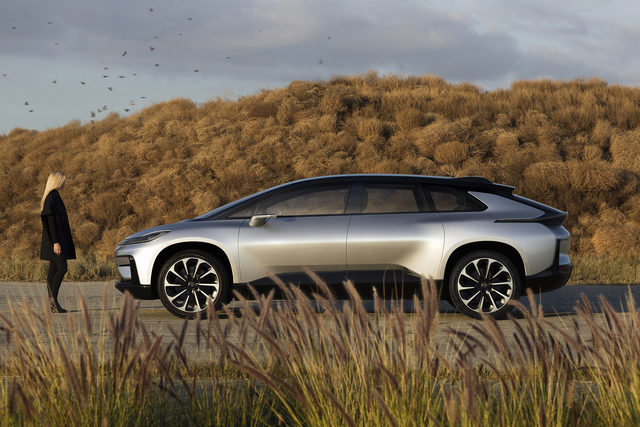 The design of the FF 91 automotive platform has been dubbed the first of a “new species of vehicle,” delivered by a talented engineering team that has installed the best features of today’s automotive technologies. A powerful propulsion system, based on the company’s variable platform architecture, combines three electric motors and an oversized battery pack rated at 130 kilowatt-hours, to deliver a driving range of 378 miles while also accelerating from 0 to 60 miles per hour in just 2.39 seconds. The vehicle drive train in the FF 91 can produce the equivalent of 1,050 horsepower with 1,800 newton-meters of torque. All this power and performance is embedded in a compact “skateboard” chassis platform with a wide wheel base that allows designers to create 151 cubic feet of comfortable interior space within the monocoque body and chassis of the vehicle. Richard Kim, vice president of design, emphasized the aerodynamic styling on the outside of the car that combines form and function to deliver a coefficient of drag rated at 0.25. Every one-tenth decrease in the coefficient number not only increases performance but also adds 12 miles of range to the electric car battery pack. An active suspension system automatically adjusts the height of the body to optimize air flow around the vehicle during acceleration and at higher speeds. The FF 91 integrates 30 smart sensors, including a retractable 3-D LiDAR turret that pops up from the front hood for perimeter obstacle detection. Side-view cameras are used in place of mirrors. Many more cameras, radar and ultrasonic sensors provide situational awareness to the vehicle from multiple directions. 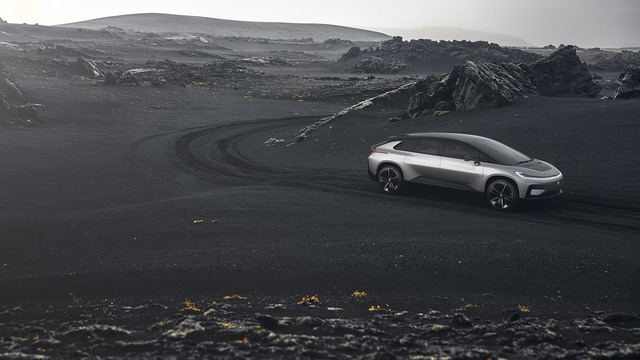 Hong Bae, the director of advanced drive assistance systems and self-driving at Faraday Future, demonstrated the self-parking capabilities of the FF 91 that leveraged these integrated sensor systems. Without a driver behind the steering wheel, the FF 91 located an empty parking spot outside the pavilion and backed up autonomously between two other parked vehicles. The vehicle chassis design also employed four-wheel steering to more nimbly maneuver into and out of the parking space. Bae emphasized that the FF 91 also employs artificial intelligence with deep learning capabilities that continue to adjust the driving performance of the vehicle for external road conditions as well as the internal driving comfort of the driver and each of the vehicle’s passengers. The automobile will recognize a unique FFID code displayed on the mobile phone app of each occupant, in order to deliver a more personalized space that includes automated seating configuration, cabin temperature control and entertainment features. Interested potential buyers can now visit the FF.com website to register for a personal FFID number that the car will recognize, as well as place a refundable deposit of $5,000 that will reserve an opportunity to purchase the electric supercar when it is produced in 2018. Click the “reserve” tab on the home page of the website. However, recent economic and political forces have been converging on Faraday Future and its chief financier, Chinese billionaire Y.T. Jia. These obstacles have slowed down construction plans for a North Las Vegas factory that was projected to hire 4,500 employees over the next 10 years at the Apex Industrial Park. Grading and foundation construction at the site in North Las Vegas were halted by contractor AECOM in November pending a financial “adjustment” in contractual relations. Nick Sampson, senior vice president of engineering, research and development at Faraday Future, stated during the FF 91 unveiling event that Phase I grading construction had been completed on the factory, with Phase II construction to resume shortly, although no specific start date was proposed. Jia, the founder and primary financial backer of Faraday Future, also appeared at the event to show his determined commitment to producing the electric supercar at the Faraday Future factory in North Las Vegas. Just before Christmas 2015, Gov. Brian Sandoval had convened a special legislative session to allow the state government to grant tax abatements to Faraday Future in order to make the Apex site more favorable than competing locations in other states. Noting ongoing financial problems with Jia’s parent company, LeEco, during a restructuring period in 2015 when trading of company shares was suspended on a Chinese exchange, Nevada Treasurer Dan Schwartz traveled to China to ensure that the backers of Faraday Future were still financially solvent. After receiving assurances from Chinese representatives of the company, Schwartz requested that money for construction of the factory be put in escrow and that Jia pay for an assurance bond to make sure that any future financial shortfalls would be cushioned. As LeEco stock resumed trading in 2016, after Faraday Future had rolled out its design concepts at CES in Las Vegas, the development of the Nevada factory seemed to be moving forward. In May, the company broke ground with an official ceremony that involved Sandoval and local government leaders from Clark County and North Las Vegas. In September, Jia announced a successful fundraising round from venture capital investors of $1.08 billion to continue research and development of mobile electric car platforms. However, once again, trading of shares of LeEco company stock on the Chinese exchange was suspended in December, as Jia’s company had become over-leveraged and required a second reorganization effort. The company founder has taken a self-imposed pay cut with a salary of just 1 yuan per year, or about 15 cents in U.S. dollars, until his company’s debt financing is turned around. The 42-year-old CEO will have a bumpy road to rebuild his company’s financial foundation and reputation in order to continue funding all of his planned ventures worldwide. Faraday Future will require additional investment to keep its talented team together, as well as to complete factory construction in North Las Vegas that will enable full-scale production of this promising electric supercar by 2018.